Rishichandra is an engineer at hasura.io. He likes to write code and lift heavy things. There is no better way to understand data than by visualizing it with charts and diagrams. The JS community has some great open-source projects that make data visualization easier, however, there has not been a go-to solution for building real-time backends that can back these charts and make them real-time. With GraphQL (which has a well-defined spec for real-time subscriptions), we can get a real-time backend running within seconds and use it to power real-time charts. Charts form an integral part of any industry that deals with data. Charts are useful in the voting and polling industry, and they’re also great at helping us better understand the different behaviors and characteristics of the users and clients we work with. Why are real-time charts so important? Well, they’re useful in cases when new data is produced continuously; for example, when using live-time series for visualizing stock prices is a great use for real-time charts. In this tutorial, I’ll explain how to build real-time charts with open-source technologies apt for exactly this particular task. Note: This tutorial requires basic knowledge of React and GraphQL. The very point behind using Charts is to visualize “huge” volumes data. We, therefore, need a database that efficiently handles large data and provides an intuitive API to restructure it. SQL databases allow us to make views that abstract and aggregate data for us. We will be using Postgres which is a time-tested and highly efficient database. It also has fancy open-source extensions like Timescale and PostGIS which allow us to build geolocation-based and time-series-based charts respectively. We will be using Timescale for building our time series chart. This post is about building real-time charts, and GraphQL comes with a well-defined spec for real-time subscriptions. Hasura GraphQL Engine is an open-source GraphQL server that takes a Postgres connection and allows you to query the Postgres data over realtime GraphQL. It also comes with an access control layer that helps you restrict your data based on custom access control rules. Docker is a software that lets you containerize your applications. A docker image is an independent packet that contains software along with its dependencies and a minimalistic operating system. Such docker images can be technically run in any machine that has docker installed. You will need docker for this tutorial. We will build the following live time series chart that shows the maximum temperature of a location in intervals of 5 seconds over the past 20 minutes from the present moment. The backend comprises of a Postgres database, its timescale extension, and Hasura GraphQL Engine. Let us get the database and our GraphQL server running by running the respective docker images. Create a file called docker-compose.yaml and paste this content into it. Note: docker-compose is a utility to run multiple docker images declaratively. This is our Postgres database with Timescale extension installed. It is configured to run at port 5432. This is our Hasura GraphQL Engine instance, i.e. the GraphQL server that points to the database and gives GraphQL APIs over it. It is configured to run at the port 8080, and the port 8080 is mapped to the port 8080 of the machine that this docker container runs on. This means that you can access this GraphQL server through at localhost:8080 of the machine. Let’s run these docker containers by running the following command wherever you have placed your docker-compose.yaml. This command pulls the docker images from the cloud and runs them in the given order. It might take a few seconds based on your internet speed. Once it is complete, you can access your GraphQL Engine console at http://localhost:8080/console. This command creates a hypertable that is partitioned by time in the field recorded_at. The GraphQL mutation above inserts a row in the temperature table. Now try to make a GraphQL query to check if the data was inserted. Now, the task at our hand is to create a live time-series chart that shows the maximum temperature of a location in intervals of 5 seconds over the past 20 minutes from the present moment. Let’s create a view that gives us exactly this data. This view groups the data from the temperature table in 5-second windows with their max temperature (maxtemp). The secondary grouping is done using the location field. All this data is only from the past twenty minutes from the present moment. That’s it. Our backend is set up. Let us now build a nice real-time chart. GraphQL subscriptions are essentially “live” GraphQL queries. They operate over WebSockets and have exactly the same response structure like GraphQL queries. Go back to http://localhost:8080/console and try to make a GraphQL subscription to the view we created. This subscription subscribes to the data in the view where the location is London and it is ordered in ascending order of the fivesecondintervals. Keeping this subscription on, open another tab and try inserting another value in the temperatures table using the same mutation that we performed earlier. After inserting, if you go back to the tab where the subscription was on, you would see the response having updated automatically. That’s the realtime magic that GraphQL Engine provides. Let’s use this subscription to power our real-time chart. This will create an empty starter project. cd into it and install the GraphQL and chart libraries. Also, install moment for converting timestamps to a human-readable format. 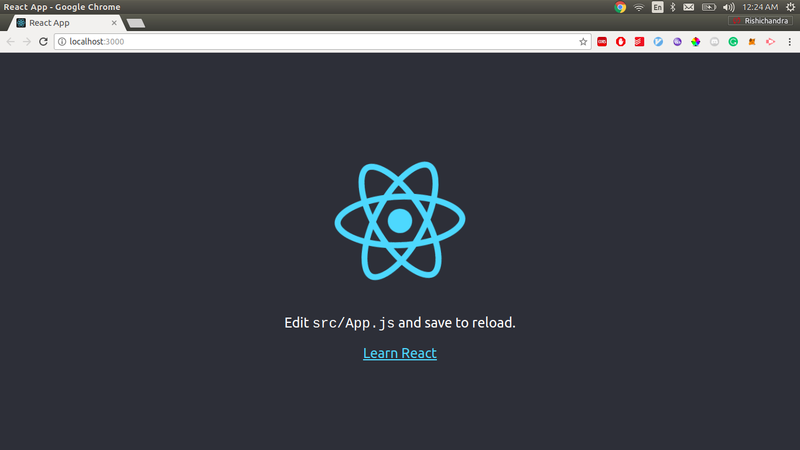 Finally, run the app with npm start and a basic React app would open up at http://localhost:3000. Apollo client is currently the best GraphQL client that works with any GraphQL compliant server. Relay modern is good too but the server must support the relay spec to leverage all the benefits of Relay modern. 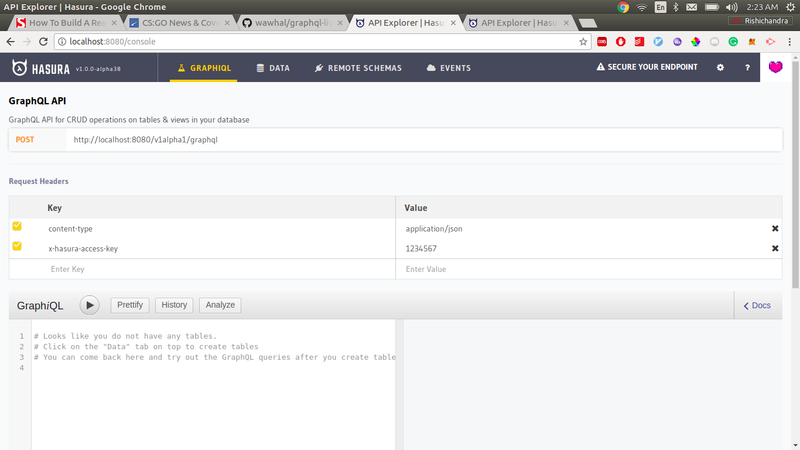 We’ll use Apollo client for client-side GraphQL for this tutorial. Let us perform the setup to provide Apollo client to the app. I am not getting into the subtleties of this setup because the following code snippets are taken directly from the docs. Head to src/index.js in the React app directory and instantiate Apollo client and add this code snippet above ReactDOM.render. Apollo client has been set up. We can now easily use real-time GraphQL from our App. Head to src/App.js. Next, we will subscribe to the data in our view and feed it to the Line chart. But how do we perform subscriptions on the client? Apollo’s <Subscription> components work using the render prop pattern where the children of a component are rendered with the context of the subscription data. Note: You can also use the open-source library graphq2chartjs for transforming the data from GraphQL response to a form that ChartJS expects. You will have a fully working real-time chart ready at http://localhost:3000 . However, it would be empty, so let’s populate some sample data so we can actually see some magic happen. Note: I have added some more options to the Line chart because I don’t like those fancy animations in ChartJS. A time series looks sweet when it’s simple, however, you can remove the options prop if you like. You can go back to http://localhost:3000 and see the chart updating.